Fed up of that annoying squeal from your fan belt every time you start the car? Yep me to. That's why I wrote this article. Luckily, the most common cause of squealing is the auxiliary belt/fan belt which can normally be fixed relatively easily by the home mechanic, the good news is that even if you do have to take the car to a garage, the cost is likely to be low. Before calling a garage, make sure you read our blog post all about the causes of squeaky/squealing fan belts and how you might be able to fix the problem by yourself for free! Confusing eh? 99% of the time these terms are all referring to the same thing, which is a belt powered by the engine to drive auxiliary components such as the cooling fan, alternator, power steering pump or air conditioning compressor. Why does the fan belt squeal? 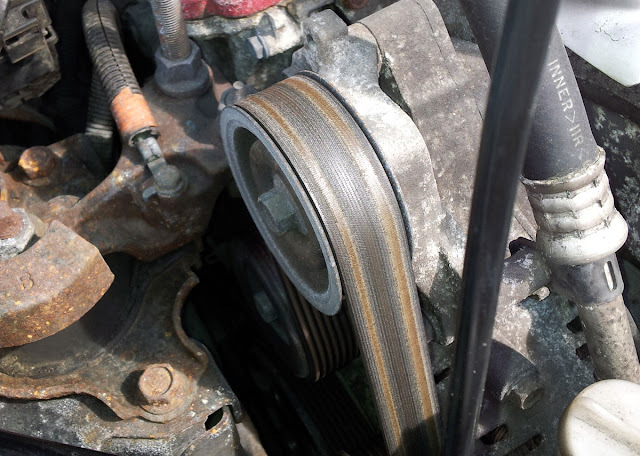 The squeal/squeak noise is caused by the fan belt slipping on the pulleys. There are several possible reasons for why this happens. When electrical load is applied to the alternator (e.g. turning the steering wheel in a car with electric power assisted steering) it takes more force to turn and so there is a greater amount of friction the fan belt must overcome to turn which makes it more likely to slip. You are more likely to hear that annoying squeaky noise on damp mornings if the car has been left overnight. This is because the dampness can cause the belt to have less grip and also because if it's cold, the alternator will have more load on it. Fan belts are made with rubbers which degrade and glaze over time. Moisture, oil and heat cycles all contribute to this process and once the belt is glazed it is more likely to slip and cause that annoying squeal sound. Quite simply, if the belt is too lose it will 'slip' on the pulleys which will cause that annoying high pitched squealing noise. A crude way to test the tension of the belt is to press on the belt between two pulleys with your thumb - you should get about 1/2 inch of deflection. This should give you a rough idea of whether your fan belt is tensioned correctly. Depending on what car you have, the tension of the fan belt will either be set manually or by an auto adjusting tensioner. If the tension can be manually adjusted then refer to a Haynes manual or similar to find out how to carry out this procedure. If your engine uses auto adjusting tensioners then these should be replaced along with the fan belt. If your fan belt belt or the various pulleys which it runs through become contaminated with oil, even just a fine mist coating, this will reduce the grip the belt has and will cause it to slip and squeal more than usual. Oil leaks in the engine bay are more likely to occur on engines with a turbo because any small leaks in the intake system or intercooler pipework (which are under pressure on boost) are likely to spray fine droplets of oil all over your engine bay. To rectify this problem you need to find and fix the oil leak (which can be easier said than done) and then replace the fan belt being sure to also clean any pullies, tensioners and guides to remove any oil residue. I have also heard of 'other fluids' such as power steering fluid or coolant causing belts to slip so it is worth checking for leaks from the reservoir as well. If the alternator bearings or any of the pulleys are seized/sticky then this could cause the belt to slip simply because it is creating more drag than the belt can handle. If the belt guides are out of alignment the belt cannot sit properly and will cause a noise. Normally, fan belt noises which are caused by misalignment of the pulleys will be more of a chirping noise than a squeal. Before spending money on new belts or professionals, the cheapest and easiest thing to try is cleaning the belt and pulleys with carb cleaner or even a mild detergent mix. In some cases the slipping belt is caused by contamination from oil or other fluids from the engine bay and simply cleaning this off will stop the noise. In any case cleaning the belt and pulleys should help increase friction slipping and causing that irritating squeaking sound. One diagnosis method is to spray a bit of water on the ribbed side of the belt when the engine is running and making the noise. If the noise stops then this is likely cause by an alignment issue. If the noise gets worse then it is likely a friction issue. Please feel free to leave any comments or tips you might have for other readers below.